Effective April 1, 2003, smoking is banned statewide in all enclosed workplaces in New York, including all bars and restaurants and construction sites. According to Wikipedia.com,the law exempts (1) private homes and automobiles, (2) hotel/motel rooms, (3) retail tobacco businesses, (4) private clubs, (5) cigar bars (A cigar bar that makes 10 percent of its gross income from the on-site sale of tobacco products and the rental of on-site humidors, not including vending machines sales are exempt from the ban), (6) outdoor areas of restaurants and bars, and (7) enclosed rooms in restaurants, bars, convention halls, etc., when hosting private functions organized for the promotion and sampling of tobacco products. 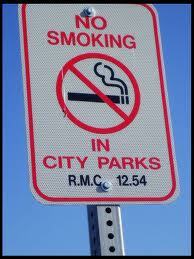 In February 2011, by a 36-to-12 vote, New York’s City Council passed a law extending the city’s smoking ban to parks, beaches and public plazas where pedestrians congregate like in Times Square and Union Square, it is the most significant expansion of antismoking laws since Mayor Michael R. Bloomberg pushed to prohibit smoking in restaurants and bars in 2002.